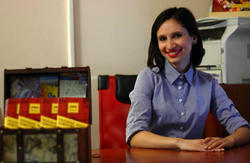 Do You appreciate comfort, affordable prices and Armenian hospitality? So do we! In case you are wondering as to where you could spend your overnights while in Yerevan city and have an extremely comfortable stay, then you're on the right page! 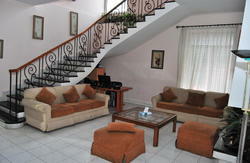 You would not regret picking an elegant duplex Penthouse hotel and hostel. The reason for that is crystal clear: Penthouse hotel and hostel is specified with its quirky character and an amazingly friendly staff. Many of our guests keep coming back time and again, it's time you come and find out why! Let us put it this way: our friendly staff, bright colors and over the top service mean we're an exciting and interesting place to stay! And then there's the free complimentary continental breakfast with tea/coffee making facilities. Enjoy each morning Armenian breakfast and take your coffee admiring the awesome view of Ararat and Yerevan from our balcony that creates calm atmosphere despite the affinity of a noisy life of the big city. Besides, you will have a kitchen at Your disposal with free tea and coffee for the whole day. 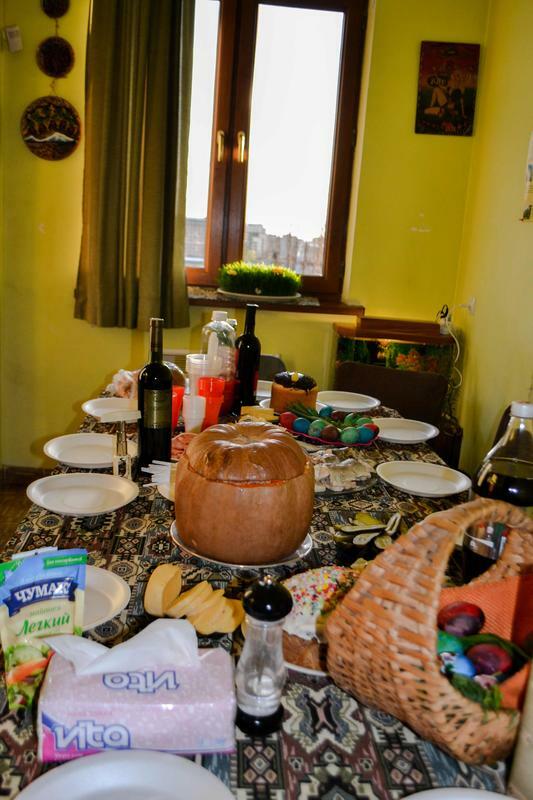 You will be overwhelmed with periodic parties we organize with Armenian food and khorovats (barbecue). We also provide you with linen, towel, free high speed Internet Wi-Fi access in all rooms and info desk. Add to that the fact that we're ridiculously close to the main bus stations in case you want to pick up a public transport. Plus we are super close to many tourist attractions of historical importance, for instance the famous Museum of manuscripts - Matenadaran, the Cascade, the Opera and Republic Square. 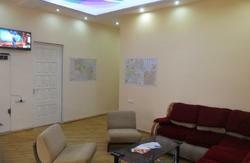 In other words our lovely hostel is located in the prestigious center of Yerevan city. And you've got to ask, why would anyone stay anywhere else? It goes without saying that all our rooms are decorated and furnished to a good standard. As to our common room, it is simply awesome, comfortable and cozy. Moreover it is a great place to make new friends that might happen to be of a different nationality. So what kind of rooms do we have to offer? At Penthouse hostel and hotel, we have it all. which holds up to eight people. Keep in mind that we also offer rather a flexible Bonus system for our group guests and those who stay more than 5 nights. Penthouse Hostel is very easy to be found. in front of the State Medical University. Penthouse Hostel is 20 minutes driving from Zvartnots airport. Most flights arrive in Yerevan at night/early morning. The best way to get to the Hostel is by taxi. It is the most convenient way, because in case you arrive at night or early in the morning there is no other means of transportation. AeroTaxi LLC is the official passenger transporter of Zvartnots. It provides safe and comfortable passenger transportation service from and to the Airport- http://www.aerotaxi.am/. For the purpose of facilitating the process you get to Penthouse Hostel from airport we have started to collaborate with Aero taxi thus elaborating a fixed price, that is 5000AMD per 3-4 persons from Zvartnots airport to Penthouse Hostel. You just need to ask the driver of Aero taxi to take You to Penthouse Hostel and provide him with the exact address. If you take another taxi, ask the taxi driver to get to the State Medical University. Do not forget to provide him with the exact address Koryun 5. In case You arrive between 8:00 20:00 and want to take a public transportation, mini-buses are at your disposal. You need to take the minibus N108, and ask the driver to stop at the bus-station near the Medical University/Shrjanayin station (on Abovyan street, Abovyan Koryun Streets crossway). The price for mini-bus is 200 AMD per person. After getting out from the mini-bus you will need only 3 minutes to get to our Hostel. Just take Koryun Street and walk towards Koryun and Heratsu Streets crossway. As soon as You find building 5 on the Koryun st. a classic style building with two towers and an arch in front of the Medical University, take the left side in front of the traffic light and Youll see the entrance with HP Penthouse sign. Please keep in mind that we are on the last floor of the building!! From the main railway station it will take you approximately 10 minutes BY TAXI to get to Penthouse Hostel, and will cost you 800 AMD. The hostel is very easy to find, however, to be on the safe side you can also provide the taxi driver with our exact address . If needed just tell our phone number to the driver so that we could explain to him the address in Armenian!! NOTE: Make sure the taxi has a meter in order not overcharge. In case you decide to take a mini-bus to the Hostel, You should take N45 from the opposite street of the Sasuntsi David Statue. It will take you about 15 minutes. The price for the mini-bus is 100AMD per person. Tell the driver to stop at the bus-station near the Medical University/Shrjanayin station (on Abovyan street, Abovyan Koryun Streets crossway). After getting out from the mini-bus you will need only 3 minutes to get to our Hostel. Just take Koryun Street and walk towards Koryun and Heratsu Streets crossway. As soon as You find building 5 on the Koryun st. a classic style building with two towers and an arch in the middle, take the left side in front of the traffic light and Youll see the entrance with PH Penthouse sign. Please keep in mind that we are on the last floor of the building! !